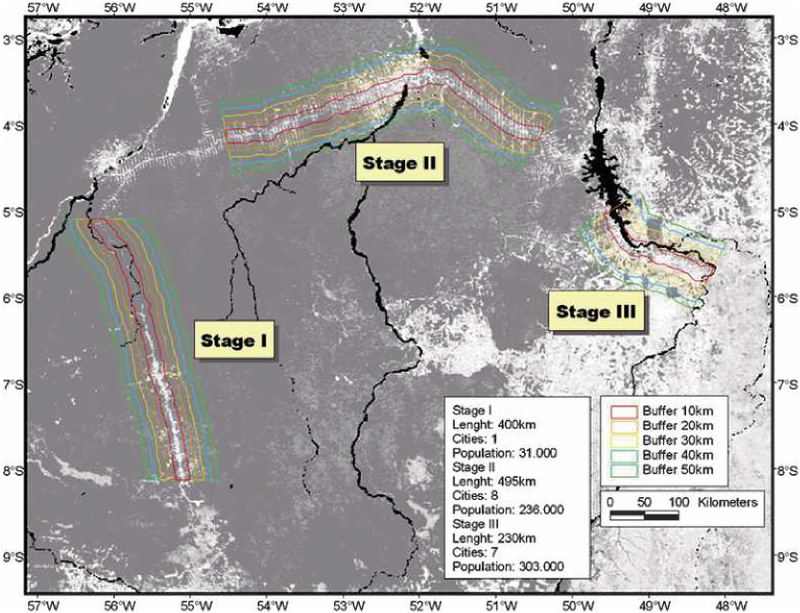 Satellite fire detection was determined from two sensors,—the Advanced Very High Resolution Radiometer (AVHRR) on NOAA-12 and the Moderate Resolution Imaging Spectroradiometer (MODIS) on both the Terra and Aqua platforms, for 2001- 2003 to characterize fire activity in Brazil, giving special emphasis to the Amazon region. Active fire data for AVHRR/NOAA-12 was produced using a fixed threshold fire detection technique based on the algorithm developed by the Centro de Previsao do Tempo e Estudos Climaticos (CPTEC/INPE) (Setzer and Pereira, 1991; Setzer et al., 1994; Setzer and Malingreau, 1996). Active fire data for MODIS/Terra and MODIS/Aqua was produced using a contextual fire detection technique based on NASA-University of Maryland algorithm (Justice et al., 2003; Giglio et al.2003). Resulting fire counts were compared for major biomes of Brazil (Figure 1), the nine states of the Legal Amazon (e.g., Tocantins, Figure 2), and two important road corridors in the Amazon region (Figure 3). In evaluating the daily fire counts, there is a dependence on variations in satellite viewing geometry, overpass time, atmospheric conditions, and fire characteristics (Schroeder et al., 2005). The data provided are the coordinates of daily active vegetation fires in Brazil for 2001 through 2003 at 1 km resolution for both AVHRR and MODIS sensors. Data are provided in both Arcview (shape file format) and ASCII comma separated (csv) file formats. Vector files for the major biomes of Brazil, the nine states of the Legal Amazon, and three important road corridors in the Amazon region are also included. 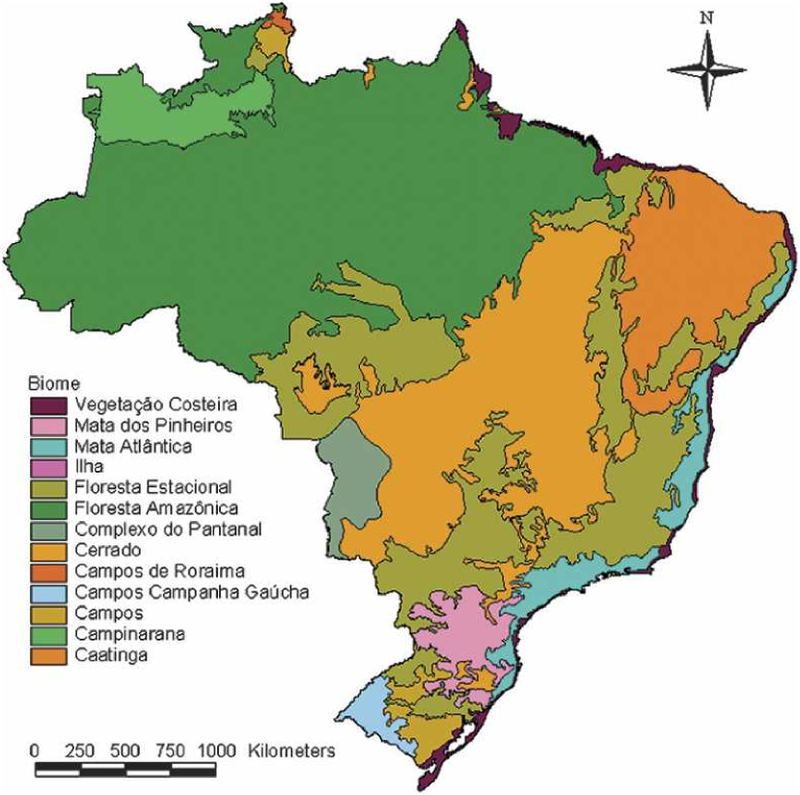 The major biomes of Brazil identified in this data set are cross-referenced to classifications and descriptions from other sources in the companion file, Brazilian Biome Classifications and Descriptions. Figure 1. General biome classification map for Brazil. Figure 2. Hot spots detected over the state of Tocantins in Brazil on 31 Jul 2001 for N O A A - 1 2 (equator-crossing time: 2026 UTC; scan angle: 7°; hot spots: 111) and N O A A - 1 4 (equator-crossing time: 2059 UTC; scan angle: 42°; hot spots: 25), superimposed on a red–green–blue (RGB) Landsat-6 image (bands: R = 5, G = 4, B = 3). Figure 3. Case scenarios in eastern Amazon region (Pará) with typical deforestation conditions; background image corresponds to the Vegetation Continuous Field where darker areas represent higher vegetation cover; black areas correspond to water bodies. Schroeder, W., J.T. Morisette, I. Csiszar, L. Giglio, D. Morton and C.O. Justice. 2007. LBA-ECO LC-23 Characterization of Vegetation Fire Dynamics for Brazil: 2001-2003. Data set. Available on-line [http://daac.ornl.gov] from Oak Ridge National Laboratory Distributed Active Archive Center, Oak Ridge, Tennessee, U.S.A., doi:10.3334/ORNLDAAC/843. The investigators were Morisette, Jeffrey Thomas; Pereira, Joao Antonio Raposo; Schroeder, Wilfrid; Csiszar, Ivan Andras; Giglio, Louis and Morton, Douglas Christopher . You may contact Schroeder, Wilfrid (schroeder@hermes.geog.umd.edu). Fire influences global change and tropical ecosystems through its connection to land cover dynamics, atmospheric composition, and the global carbon cycle. As such the climate change community, the Brazilian government, and the Large Scale Biosphere-Atmosphere study in Amazonia (LBA) are interested in the use of satellites to monitor and quantify fire occurrence throughout Brazil. As multiple satellite and algorithms are being utilized, it is important to quantify the accuracy of the derived products. LBA-ECO LC-23 Vegetation Fire Data, Roraima, Brazil: 2003. LBA-ECO LC-23 Aster and Modis Fire Data Comparison for Brazil: 2003-2004. The daily active fire data provide coordinates of vegetation fires in Brazil at 1km resolution for both AVHRR and MODIS sensors. All files are in shape file format and can be used in GIS software such as Arcview. The various sub-files of the shape files have been zipped so that each zip file contains data for one shape file. The shape files are in geographic projection and in WGS-84 datum. 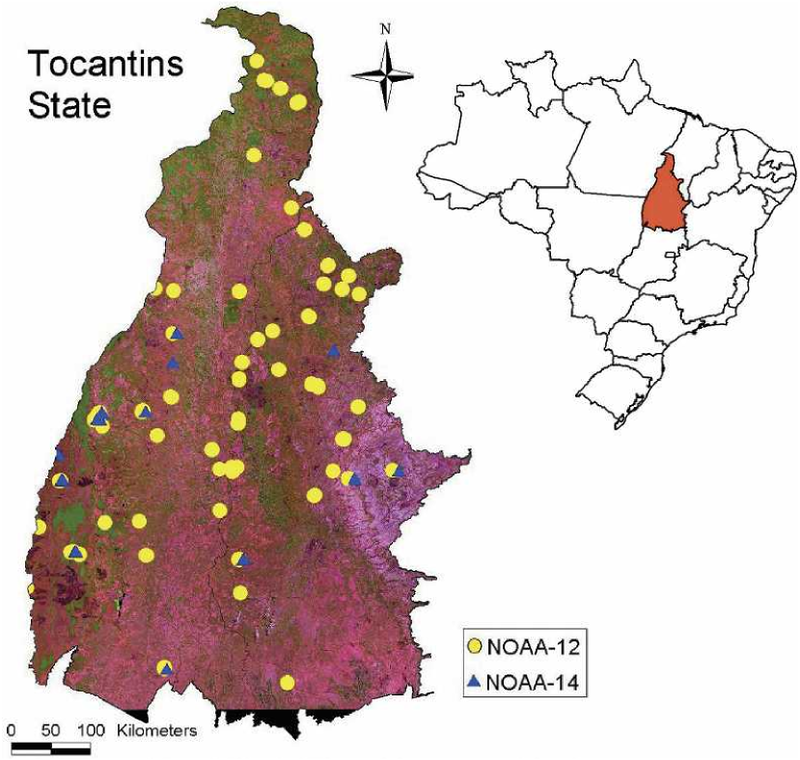 Fire counts were assessed for major biomes of Brazil, the nine states of the Legal Amazon, and two important road corridors in the Amazon region. Vector files for these features are also included and described below. The data provided are the coordinates of daily active vegetation fires in Brazil for 2001 through 2003 at 1km resolution for both AVHRR and MODIS sensors. Data are provided in both Arcview (shape file format) and ASCII comma separated file formats. Vector files for the major biomes of Brazil, the nine states of the Legal Amazon, and two important road corridors in the Amazon region are also included. Active fire data available in Arcview shape file format. Active fire data available in comma separated ASCII format. Vector files describing physical features of study area. Produced by the Instituto Brasileiro de Geografia e Estatistica (IBGE). Produced by the Instituto Brasileiro de Meio Ambiente (IBAMA). Stage I coincides with the main axis of highway BR-163. Stages II and III coincide with the main axis of highway BR-230. Active fire data for AVHRR/NOAA-12 was produced using a fixed threshold fire detection technique based on the algorithm developed by the Centro de Previsao do Tempo e Estudos Climaticos (CPTEC/INPE)(Setzer and Pereira, 1991; Setzer et al., 1994; Setzer and Malingreau, 1996). Active fire data for MODIS/Terra and MODIS/Aqua was produced using a contextual fire detection technique based on NASA-University of Maryland algorithm (Justice et al., 2003; Giglio et al.2003). Schroeder, W., J.T. Morisette, I. Csiszar, L. Giglio, D. Morton, and C.O. Justice. 2005. Characterizing Vegetation Fire Dynamics in Brazil through Multisatellite Data: Common Trends and Practical Issues. Earth Interactions 9(13):1-26. Raw satellite imagery used to run detection algorithms by CPTEC/INPE and NASA/UMD. AVHRR/NOAA-12 images were received and archived by the Instituto Nacional de Pesquisas Espaciais (INPE) in Brazil; MODIS images were received and archived by NASA. Giglio, L., Descloitres, J., Justice, C. O., and Kaufman, Y., 2003, An enhanced contextual fire detection algorithm for MODIS. Remote Sensing of Environment, 47, 1311-1318. Justice, C. O, Giglio, L., Korontzi, S., Owens, J., Morisette, J. T., Roy, D., Descloitres, J., Alleaume, S., Petitcolin, F., and Kaufman, Y., 2002, The MODIS fire products. Remote Sensing of Environment, 83, 244-262. Morisette, Jeffrey T., Louis Giglio, Ivan Csiszar, Alberto Setzer, Wilfrid Schroeder, Douglas Morton and Christopher O. Justice. 2005: Validation of MODIS Active Fire Detection Products Derived from Two Algorithms. Earth Interactions: Vol. 9, No. 9, pp. 1–25. Setzer, A. W., and Pereira, M. C., 1991, Operational detection of fires in Brazil with NOAA/AVHRR. 24th International Symposium on Remote Sensing of the Environment,Rio de Janeiro, Brazil (Ann Arbor, E.R.I.M. ), 469-482. Setzer, A.W., Pereira Jr, A.C. and Pereira, M.C., 1994, Satellite studies of biomass burning in Amazonia: some practical aspects. Remote Sensing Reviews, 10, 91-103. Setzer, A. W., and Malingreau, J. P., 1996, AVHRR Monitoring of Vegetation Fires in the Tropics: Toward the Development of a Global Product. In Biomass Burning and Global Change, Vol. 1: Remote Sensing, Modeling and Inventory Development, and Biomass Burning in Africa, edited by J. S. Levine (MIT Press: Cambridge MA), pp. 25-39.